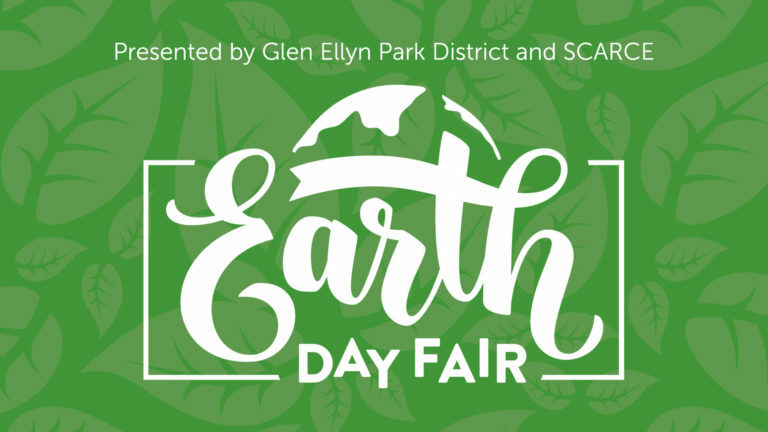 Celebrate Earth Day outside with SCARCE and the Glen Ellyn Park District at this free, family-friendly event. Go on a guided hike, partake in an eco-workshop, paddle Lake Ellyn, relax to live music, shop the earth-friendly market and more! 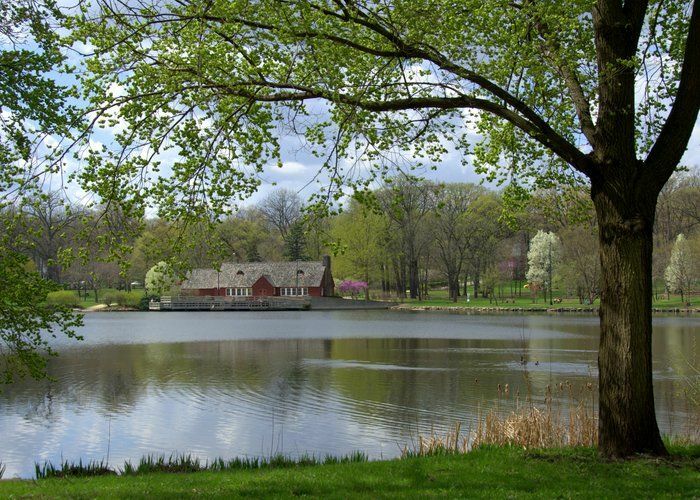 Join us at beautiful Lake Ellyn! 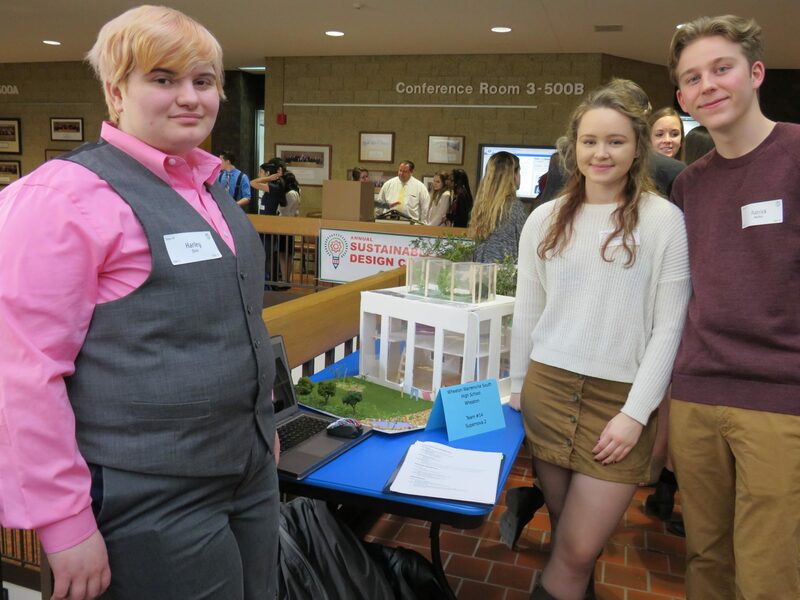 Learn about innovative sustainable building models made by local high school students for this annual design competition. Open to the public from 9am-11am. Is your high schooler interested in participating? Register through April 3rd. Are you in an environmental field? Volunteer as a judge! Contact carrie@scarce.org to get involved. Thinking about going solar? Now's the time! New state incentives passed with the Future Energy Jobs Act have just started kicking in. Combined with federal tax credits - that are set to decrease - now's a great time to go solar in Illinois! 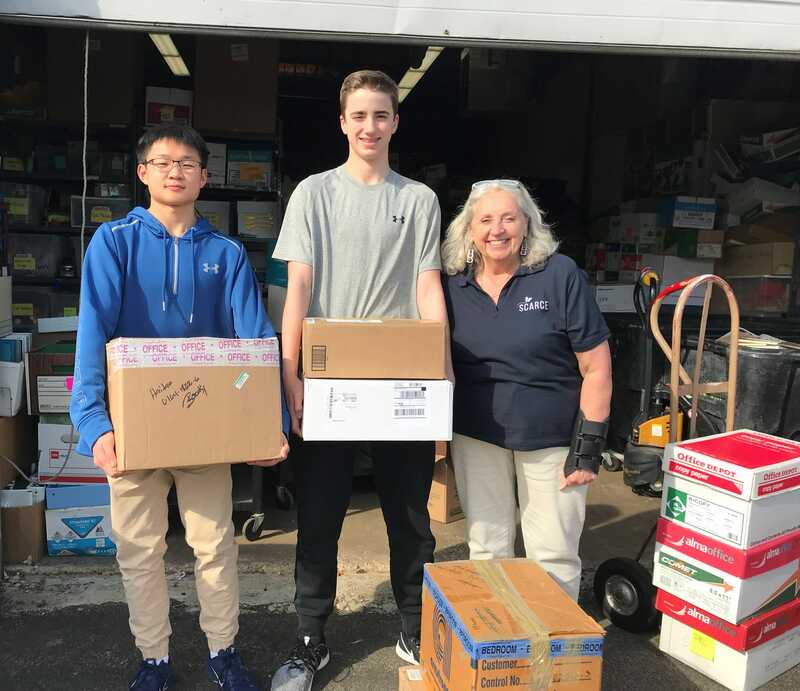 This month, Invesco of Downers Grove was awarded an Earth Flag, local Naperville North students ran a book collection to improve literacy, and a Wheaton college student forged long-term partnerships for a zero waste program at school. Click through to learn more about their efforts. 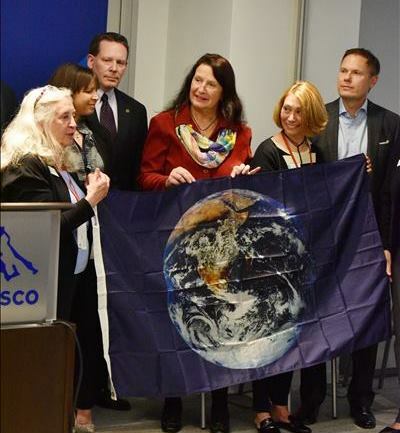 Invesco accepts their Earth Flag. 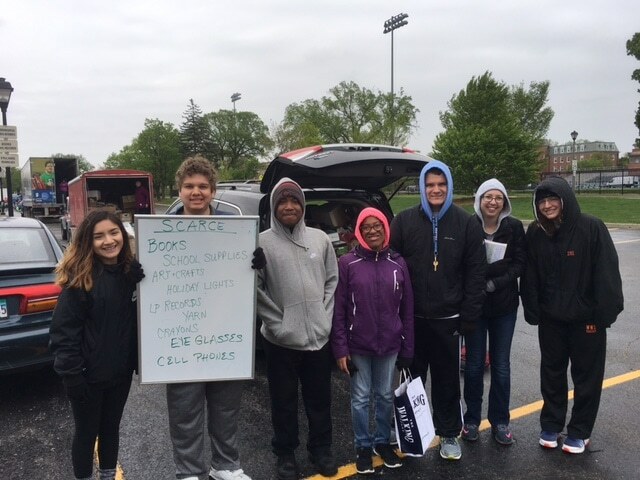 Naperville North students drop off 159 books they collected for SCARCE. 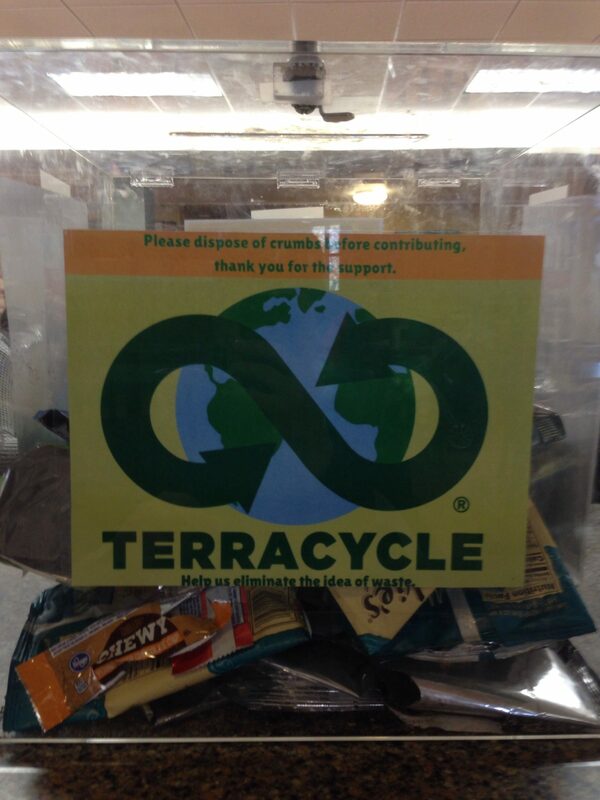 The Terracycle bin in 'the Dugout' student cafeteria at Illinois Wesleyan. Is your playground or athletic field healthy? Artificial turf used on athletic fields and a variety of materials used on playground surfaces contain chemicals of concern to human health and the environment. Check out these resources to ensure a healthy playspace for our youth and the environment. York High School in Elmhurst has partnered with SCARCE to run a used book sale which will be open to the public. 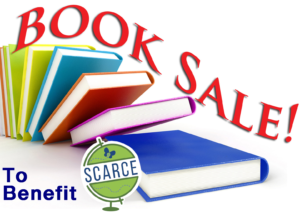 All proceeds from the book sale will support SCARCE's resource center for teachers and non-profits. Saturday, May 11th - Pre-order your seedlings, compost, and rain barrels! Green up your green thumb at SCARCE's annual kick-off to the growing season! Purchase local, organically grown seedlings for your veggie patch, learn about permaculture or beekeeping in a free mini-workshop and more! Pre-orders are encouraged for the best selection. SCARCE is now collecting x-ray and lithographic film for recycling. Please remove any paper sleeves or medical information and bring films to SCARCE during our regular donation hours Tue-Fri 9am-4pm. Bring your damaged or expired car seats, car seat bases, harness or booster car seats to Target for recycling. Get a 20% off coupon for each seat you bring in. Clean and empty shoe boxes with lids are needed at the Willowbrook Wildlife Center in Glen Ellyn for the spring baby season. Learn more about what can be donated or contact for more info . 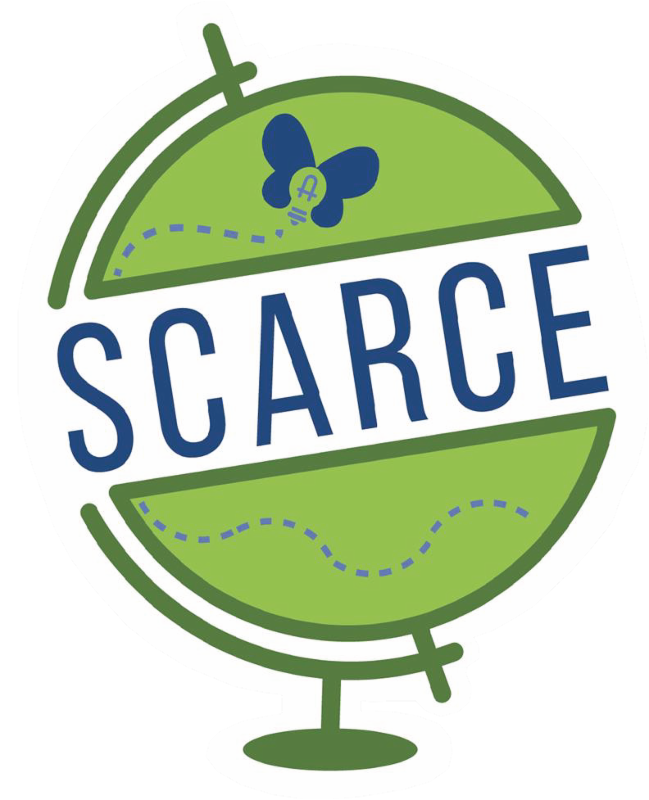 SCARCE needs your help collecting items for recycling and reuse throughout our communities. 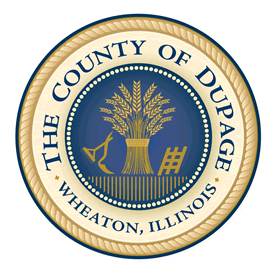 Volunteers are needed to assist SCARCE staff at events around DuPage County. Earn service hours for school, college, confirmation etc. while helping the earth and your fellow community members! Since 2006 the GreenFaith Fellowship Program has trained over 200 leaders from across the world to answer the call to action to protect our shared home. Clergy, religious leaders, and active members of faith communities are invited to apply. Do you have wearable shoes at home that you are looking to donate? Check out the two shoe drives below! First United Methodist Church of West Chicago (643 E. Washington Street) collects re-wearable shoes for the ShoeCrew Water Projects. Bins are located outside of the church on an on-going basis. They've sent over 28,000 pairs of shoes to the ShoeCrew - which provides small businesses with shoes for resale and funds well construction in Africa with the proceeds. The Morton Arboretum in Lisle is collecting re-wearable athletic shoes as part of their Champion of Trees 10K run on April 14th. Arrive before 9am to get free entry and to donate your shoes. They will accept shoes now until the day of the run though the admission fee will not be waived. Do you know someone living with asthma? May is asthma awareness month - check out this free 40 min training program from the Minnesota Dept. of Health. Learn how to identify and reduce indoor triggers for a healthier home for all. Donations must be boxed. Boxes not weigh more than 30 lbs. Items must be packed such that the lid or flaps close flat and boxes can be stacked. For donations of 5+ boxes, call to schedule your drop-off 630-545-9710.
Review our list of accepted items here. Thank you for helping us take care of your items! Each year,100 million plastic water filters are thrown out. The new V2 reusable and refillable water filter allows you to eliminate the waste from plastic water filter cartridges. Check it out on Kickstarter and if you love it - get in on it as a supporter. 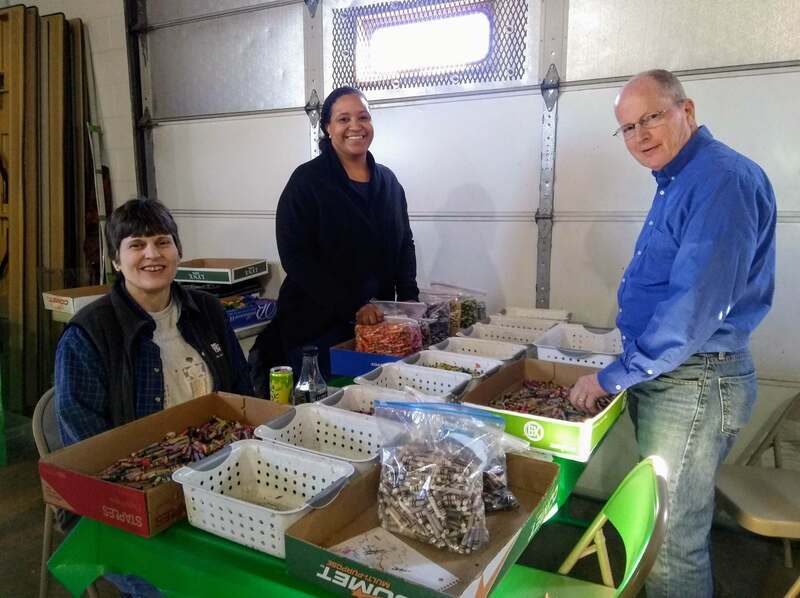 Cantigny Park employees spent a full day making super crayons in March. 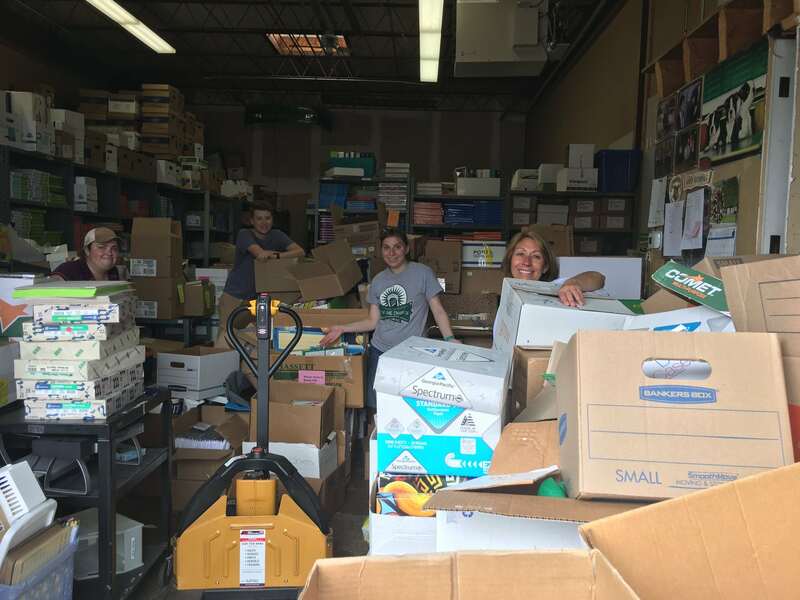 Our book rescue couldn't function without these amazing individuals that dedicate their time each week to sorting, stocking, and organizing your donations! We can't thank them enough! If you see them when you visit, give them a high-five!